The Federal Attorney for Environmental Protection (PROFEPA), together with the National Commission of Natural Protected Areas (CONANP), has conducted surveillance in the Whale Shark (Rhincodon typus) feeding and sighting areas. It is worth mentioning that these zones include Jurisdiction Federal Waters of Isla Contoy, in the state of Quintana Roo. Whale shark on Isla Contoy. 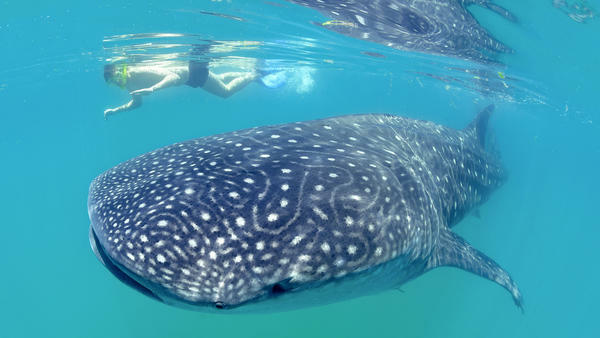 On the first day of the tour, observation, swimming and snorkeling activities with whale sharks were suspended to the vessel called Los Hermanos JMRS, which provided the service to two tourists who used a drone (device prohibited for swimming with these specimens), since the captain of the vessel exhibited an expired authorization granted by the CONANP, for which reason the corresponding inspection certificate was canceled. In total, a review of the documentation of 53 tourist boats dedicated to the activity of observation, swimming and free diving with Whale Shark was carried out, verifying its validity and issuance by the General Directorate of Wildlife of the SEMARNAT, as well as by the Commission National Program of Protected Natural Areas (CONANP) to undertake the respective non-extractive exploitation. Also, four vessels whose captains did not carry on board the corresponding authorization were withdrawn from the area, of which two were private and two tourist-type vessels, who intended to perform the observation and swimming activity with Whale Sharks, as well as a fishing vessel that pretended to carry out activities of fishing of scale in the zone of sighting and observation of the Shark Whale. The sighting season started on May 15 and ends in mid-September. The arrival of 400 specimens in the Mexican Caribbean area is estimated for this season. The whale shark (Rhincodon typus) is the largest fish in the world with about 20 meters long (60 feet), for more than 60 million years it has been crowned as the largest fish in the world. It is not carnivorous and totally harmless to humans, but it should be mentioned that today it is seriously threatened, it is hunted for artisan purposes and to obtain its meat. Besides, the chemical substances contained in sun block and tanning oils used by the people swimming with Whale Sharks, is seriously damaging this species. Thousands of people using these creams and oils are getting in the ocean with these magnificent gentle giants of the sea, and this is not good for the animal’s health. It should be noted that the Whale Shark is not considered endangered yet, but it is a species at risk within the Official Mexican Standard NOM-059-SEMARNAT-2010, under the category of Threatened (A).